American Composer Re-imagines Giovanni Anerio’s Work for the 21st-Century in the Church where Anerio’s music was first performed four centuries ago. Rome, Lazio/Italy: Five new oratorios, composed by J.J. Wright and based on the works of Giovanni Anerio, will be premiered on Thursday, June 1 at 21:00 at Chiesa Nuova. Sponsored by the University of Notre Dame (Indiana, USA) and the Pontificio Instituto di Musica Sacra (Roma), the concert and will feature a combined chorus of students from both institutions jazz ensemble. The concert is free and open to the public. The newly composed works are based on the Liturgy of the Word from the Christian Easter Vigil Mass. Five dramatized biblical and devotional scenes based off of Giovanni Anerio's Teatro Armonico Spirituale di Madrigale (1619) are reimagined using the languages of jazz and contemporary music. Teatro was originally created for and performed in the Chiesa Nuova Oratorio Church exactly 400 years ago. Conceived by Grammy award winning conductor, pianist, and composer J.J. Wright, this work follows the critical success of his Advent and Christmas cantata, O Emmanuel, which quickly became a classical bestseller and spent weeks on top on the Billboard Classical Charts. The Oratorio Vespertino services in early 17th-Century Rome, including Teatro, were some of the city’s most well attended musical and spiritual offerings. Wright’s new project examines how the Vespertino services at Chiesa Nuova allowed the oratorio form to flourish. Wright’s new oratorios incorporate the best practices of this revered movement in order to spur a rebirth of sacred music and Christian devotion in the 21st century. For more information visit jjwrightmusic.com or international.nd.edu/global-gateways/rome/. Per il poster in italiano clicca QUI. I had the incredible privilege to speak with Scott Simon for an extended interview about "O Emmanuel". Listen to the interview below and click HERE to order the album. 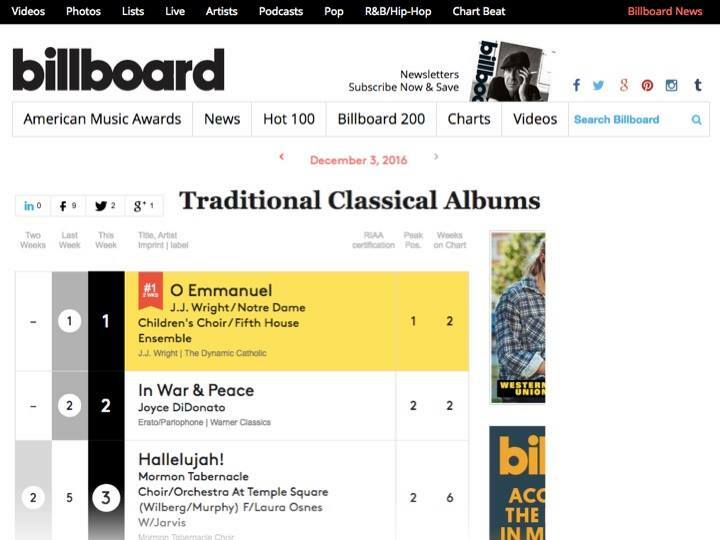 After debuting at #1 on the Billboard Classical Traditional Chart last week, "O Emmanuel" held on to the top spot for a 2nd consecutive week! Experience Christmas music at its very best. O Emmanuel, a new album by J.J. Wright and the Notre Dame Children’s Choir, takes you on a compelling journey into the heart of Christmas through creative renditions of the texts and melodies of Advent (“O Come, O Come Emmanuel”, “Gabriel’s Message”) and Christmas (“Lo, How a Rose E’er Blooming”, “Hodie Christus natus est”). The children’s voices, jazz piano trio, adult vocal soloists, and instrumentalists of Fifth House Ensemble work together to create an unforgettable Christmas-listening experience. Recorded at the University of Notre Dame’s DeBartolo Performing Arts Center, this album was produced and edited by GRAMMY Award-winning producer Thomas Moore and engineered by GRAMMY Award-winning engineer Robert Friedrich of Five/Four Productions, Ltd.
To celebrate the final week of Ordinary Time and end of the church year, here is Herbert Howells' Gloria from the Office of Holy Communion. Recorded September 13, 2015 at St. Joseph Chapel, Holy Cross College. Video and audio editing by Dan Nichols. Footage from my recent conducting recital, featuring the works of English composer, Herbert Howells. This video features the Notre Dame Recital Choir and was recorded September 13, 2015 at St. Joseph Chapel, Holy Cross College. "Vespers for the Feast of the Immaculate Conception is an interdisciplinary concertized vespers service that combines new music, jazz, baroque music, Christian liturgy and musicological scholarship. It is scored for a quartet of vocal soloists, string quartet, basso continuo, and jazz piano trio. The composition is being written for the “Performing the Scholarship” recital series, sponsored by the Sacred Music Program at the University of Notre Dame. A Concert for the Feast of the Presentation of the Lord - Notre Dame Conductor's Chorus and Orchestra, Conducted by J.J. Wright. 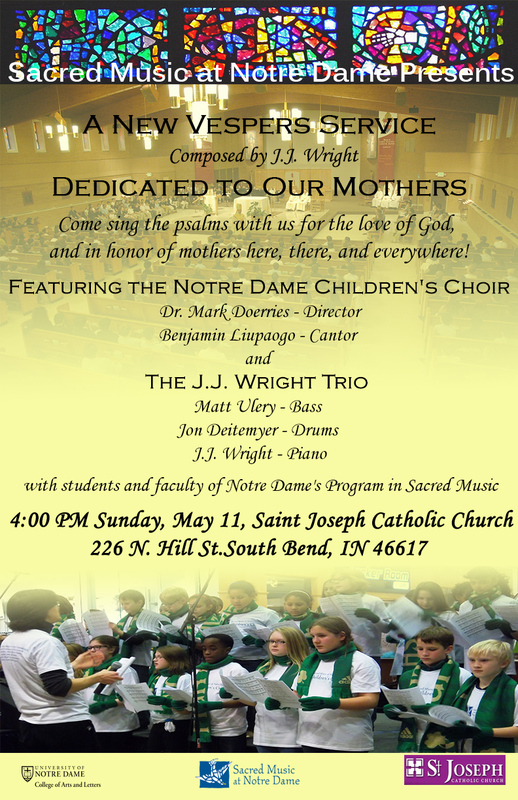 Sacred Music at Notre Dame Presents: A New Jazz Vespers Service Dedicated to Our Mothers. 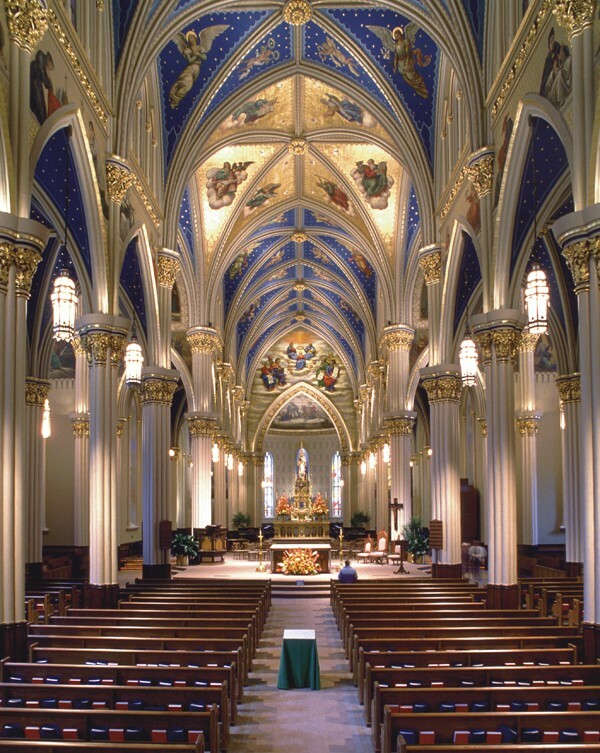 Come join the Notre Dame Children's Choir, The J.J. Wright Group, and Faculty and Staff from the Program of Sacred Music at the University of Notre Dame for a participatory Vesper's Service at St. Joseph's Church in South Bend, IN. The Notre Dame Children's Choir is directed by Dr. Mark Doerries. J.S. Bach - Ich habe genug, BWV 82. Conducted by J.J. Wright and featuring Stephen Lancaster - Baritone, and Katelyn Simon - Oboe. A Concert for the Feast of the Presentation of the Lord - Notre Dame Conductor's Chorus and Orchestra.